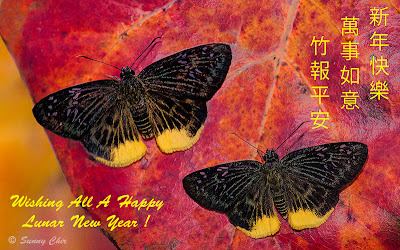 Butterflies of Singapore: Happy Lunar New Year 2013! ButterflyCircle wishes all its Chinese readers all around the world a Happy and Prosperous Lunar New Year 2013! The photo featured here shows two recently-eclosed individuals of the Yellow Flat (Mooreana trichoneura trichoneura) placed together on a backdrop of a orange-red leaf. This shot was courtesy of ButterflyCircle member Sunny Chir.